There’s a new risk czar in Malvern. 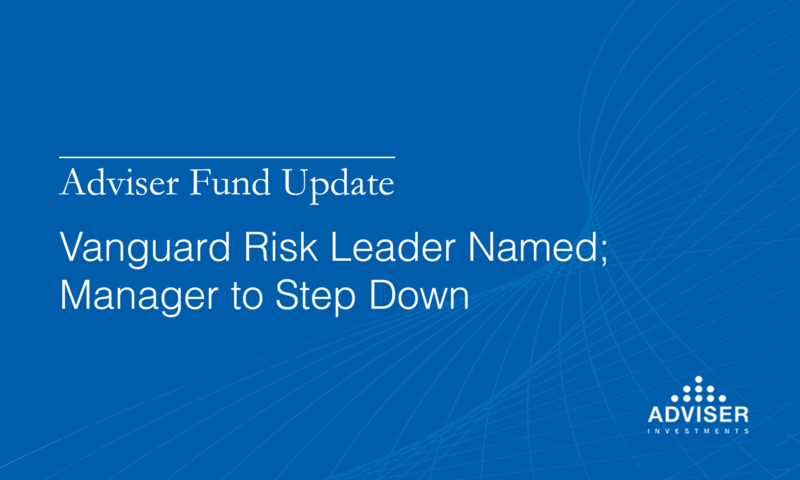 Last month, Vanguard unveiled some leadership changes, chief among them the creation of a new position: Global chief risk officer. And to fill that role, Vanguard selected Joseph P. Brennan. Brennan will oversee the firm’s current risk management organization and monitor all enterprise security and investment risk management. He will report directly to CEO Tim Buckley. Brennan previously served as the head of the firm’s Equity Index Group. He will be replaced as equity chief by Rodney Comegys, who will supervise Vanguard’s equity index management teams, who all told manage $3.1 trillion across 319 mutual funds and ETFs. Brennan has been climbing the ladder at Vanguard since 1991. He cut his teeth in the Fixed Income Group before transferring to the Portfolio Review Department, where his duties included investment manager search and oversight. Eventually, he led that group for five years. Brennan was selected as chief investment officer of the Asia-Pacific region in 2009. In 2013, he took the helm of Vanguard’s Equity Index Group. His successor, Comegys, has been in the investment industry for nearly two decades, most recently acting as head of the Risk Management Group in Vanguard’s Investment Management Group, overseeing risk analysis for the Fixed Income, Equity Index and Quantitative Equity Groups. Like Brennan, Comegys previously was head of investments and head of the Equity Index Group, both in the Asia Pacific region. Vanguard also credits him with playing a key role in growing Vanguard’s business overseas by launching new ETFs and building processes and technology for its equity and trading systems. Comegys was a submarine officer in the U.S. Navy prior to joining Vanguard in 1999. These changes likely won’t have a discernable impact for individual investors. Instead, they show some of the evolutionary changes that Vanguard is making to try to continue to deliver on its low-cost and performance-related objectives. Risk officers are commonly found in the mutual fund industry, providing an additional layer of oversight over the portfolio construction process. Brennan’s prior experience should serve him well in this role. After 15 years as a subadvisor on Vanguard’s $49.6 billion Windsor II fund, Sheldon Lieberman will be retiring at the end of the year. Lieberman works at Hotchkis & Wiley Capital Management, where he co-manages a portion of Windsor II alongside George H. Davis. Scott McBride will assume Lieberman’s co-managerial role with Davis when the opening bell rings in 2019. The firm currently manages 16% of the fund’s overall assets. We don’t expect investors will notice much of a difference after Lieberman goes. That’s no slight on him. Rather, the fund is one that suffers from a multi-manager muddle that makes it difficult to discern who is adding value for shareholders and who may be causing performance to lag. With 10 managers from five firms in the mix, the fund is a pale shadow of what it once was when it was run solo by Jim Barrow, who stepped down at the end of 2015. By the time Barrow left, his firm Barrow, Hanley Mewhinney & Strauss was managing less than 60% of the fund’s assets. That number dwindled to 46% as of April 30, 2018, according to the fund’s semiannual report. Other management responsibilities fall to Lazard Asset Management (21%); Sanders Capital (16%) and the Vanguard Quantitative Equity Group (1%). Vanguard will claim that stacking multiple subadvisors on a fund reduces manager risk. Its contention is that the practice insulates against a single fund manager severely underperforming and dragging a portfolio down with them. Likewise, it gives insurance against a fund changing direction upon the retirement of a manager, something Windsor II shareholders need not worry about. Plus, Vanguard does not publicly disclose the performance of individual subadvisors on multimanager funds. There’s no way to tell which manager is boosting and which manager is harming performance. When you observe a collection of active managers each running individual funds, the winners and losers are much more readily apparent. At Adviser Investments, one of our fundamental principles is that we buy the manager, not the fund. We believe in our time-tested approach of investing with active managers who have a long-term track record of strong risk-adjusted returns over market cycles and letting them do what they do best. Why water down the impact of true, verifiable investment talent on your portfolio? Vanguard’s giving you more options to use your money to do some good. On October 4, the Malvern, Pa.-based fund giant launched seven new investment options—including three new environmental, social and governance (ESG) investment vehicles—through its grant-making organization, the Vanguard Charitable Endowment Program (VCEP). VCEP donors are now able to direct contributions into three new pools: ESG U.S. Stock, ESG International Stock and ESG Global Stock, which are invested in two exchange-traded funds that were opened to investors in mid-September (the ESG Global Stock pool is a proprietary 70/30 mix of the ESG U.S. Stock ETF and ESG International Stock ETF). It also debuted Total International Bond, Balanced Index and Wellington as options to grow your charitable donations. In August, the fund titan announced the Income pool, a multifund portfolio option, to VCEP donors. The Income pool seeks to protect principal while earning income with an asset allocation of 20% to stocks and 80% to bonds. In conjunction with the launch of the Income pool, Vanguard discontinued its Gift Preservation pool. As of September 19, assets invested there were automatically swapped into the Income pool replacement. The fund names may be familiar, but investors may not be as familiar with the VCEP, a very simple and tax-efficient means of making tax-deductible gifts to nonprofit organizations. You can donate stocks, bonds, cash, fund shares or other securities to the program, and they will be sold and placed into a portfolio of your choosing. These assets become part of your personal charitable account, titled however you want. With the addition of these seven funds, VCEP investors now have 20 investment options to choose among. How’s it work? To start, you need to make a minimum $25,000 gift to the program (the minimum for subsequent gifts drops to $5,000). The benefit of the VCEP is that it allows you to donate your assets to the Endowment and take the tax deduction immediately. Then, you have years to decide where the money should go. And when you make donations out of the charitable account, you can choose whether to make them anonymously or with recognition. Officially, once you’ve donated to the VCEP, you have no legal control over where or how your donation is distributed. The program is considered “donor advised,” so Vanguard will take your recommendation on how to invest assets, as well as which organizations should receive grants. But in practice, you’ll be able to direct your investments and grants the way you want. There are two account types: “Standard” (for accounts up to $1 million) and “Select” (ongoing balances of more than $1 million). As for costs, the first $500,000 in your account is charged with an administrative fee of 0.60%, and additional assets over $500,000 see decreased fees of 0.40%. Donors that qualify for Select status pay just 0.13% on the next $29 million in their account, and that cost goes down to 0.05% on the $70 million after that. Have $100 million or more to donate? Call us, Vanguard says. The fees are on top of the fees of the individual funds that your money will be invested in—being Vanguard, those are among the industry’s least expensive. Altogether, that’s far less than it would cost you to open your own small charitable foundation. As mentioned above, charitable gifts qualify for tax deductions, and as in years past, only those itemizing deductions on their tax returns will qualify for them. However, with the higher standard deduction this year, it may make less sense for certain individuals to itemize based on their personal circumstances. If you have any questions about how charitable deductions will be handled for tax-year 2018, what it means for you (the tax deadline for charitable deductions is December 31 each year) and, more fundamentally, whether such contributions make sense considering your personal situation, we’d encourage you to contact a tax professional. For more information, you can also listen to Vice President Rick Winters and Director of Research Jeff DeMaso discussing the topic in a recent episode of The Adviser You Can Talk To Podcast. Tax benefits or no, the VCEP is a great option for folks who’d like to build up their own charitable fund and make grants to the organizations and causes they support. Fidelity and other fund companies offer similar programs as well, so do some comparison shopping to find the one that best suits you. Please note: This update was prepared on Friday, October 5, 2018, prior to the market’s close.